The show is free and open to the public. 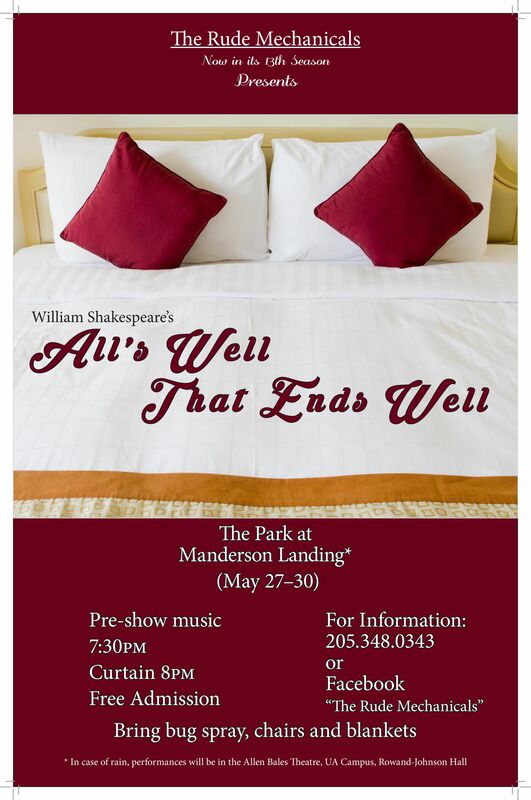 The show runs from May 26 to May 30. All performances will take place at Manderson Landing. Music starts at 7:30; show starts at 8:00. In case of rain (it will likely rain), the show will relocate to the Allen-Bales Theatre at the University of Alabama. For more information, see the Rude Mechanicals Facebook page or call (205)348-0343. We do not hold auditions. We try to find a place for everyone that wants to get involved. Visit the Facebook page and post a comment, voicing your interest. We will find a place for you!